Our Rt. 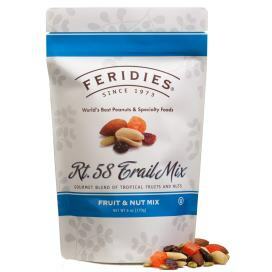 58 Trail Mix includes super extra-large Virginia Peanuts, sweet almonds, crunchy pepitas, succulent raisins, sweet dried cranberries and bright fruity papaya. US Route 58 is the longest road in Virginia. It is an East-West US Highway that runs for 508 miles from Rt. 25E just northwest of Harrogate, TN to US Rt. 60 in Virginia Beach, VA. Southampton County, along this historic highway, is home to FERIDIES and The Peanut Patch Gift Shop owned and operated by the Riddick family. Travelers, whether by bike or car are always searching for a great snack for their adventures. Rt. 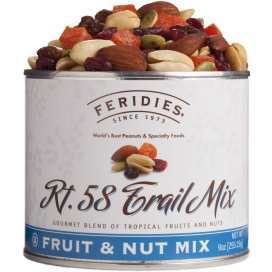 58 Trail Mix is a delightful blend of tropical fruits and nuts that hit the spot! A healthy trail mix choice that is OU Dairy Kosher Certified.